Competition does amazing things. Not only do the manufacturers try to get one up on each other by making a better product, but the us consumers get a load of options to choose as well before we put our hard earned money down. 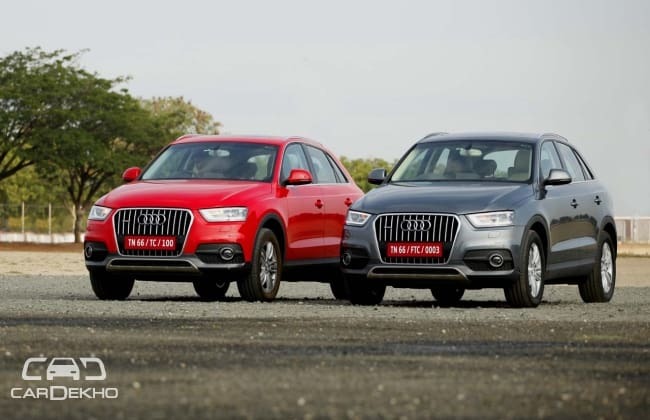 Now the Q3 was Audi's entry level SUV offering which proved to be an extremely able product and made sure Audi racks up those massive sales numbers. The Q3 follows the unmistakable Q design language and even though its been around for a while, it still looks quite fresh. Audi has added a few subtle touches to update the car and while as a whole one can't really make out the differences, but then its the details where one can notice the changes. At the front, the Q3 gets the new family grille with chrome slats with the skid plates getting chrome treatment as well. The new wedge-shaped headlights come with Xenon Plus units along with with LED daytime running lights. Then there are the new 17-inch alloy wheels, the design of which i found too flowery but then looks are always subjective. Moving to the back, the Q3 Dynamic also gets new clear lens LED tail lights which look brilliant. While the new car isn't an all-new design the new details have indeed freshened up the looks. The Q3 was always a good looking SUV and that remains so even now. Stepping inside the Q3, you immediately notice the premium interiors. While the dashboard and interior colours differ depending on the kind of customization one chooses. We got one in an all black trim that we thought looked fab and a black beige combo for those who prefer some contrast. The dashboard features a single wooden insert with plenty of aluminium bits thrown around which makes it quite sporty. The driving seat offers a typical high perched driving position which SUV's are known for and offers a pretty commanding view of the road. There is plenty of kit like the really cool fold-out 6.5 inch monitor, Driver information system, Audi system, voice dialogue system and then some. There is even a panoramic sunroof should your co-passenger decide to pop his/her head out and check the temperature up there. Moving to the back bench, the Q3 is quite a wide car, all of 1831 mm which means its a proper 3 seater and there is plenty of legroom too. An SUV needs proper luggage space as well, and the Q3 has no qualms swallowing up your weekend luggage with ease. 460 litres of easy loading luggage area! Quality, space and features, the Q3's got the interiors covered well. The Q3 gets the smallest engines in the Q range of vehicles. There is the 30TDI with the 2.0 litre diesel unit with a 6-speed manual transmission pushing out 140 PS powering the front wheels and a 35TDI which is again the same 2.0 litre unit but in a more powerful state of tune pushing out 178 PS and powering all four wheels thanks to the quattro system and a 7-speed S tronic dual clutch automatic gearbox. We got behind the wheel of the latter and immediately getting off the block tells us that its a brilliant engine. Refined and with adequate drive, the Q3 potters around in traffic with ease. Slot that lovely aluminium gear lever in tip-tronic mode and you can choose what gear you want to be in. The new Dynamic variant however has an ace up its sleeve and not to mention a very important button on the dashboard. The Drive Select button lets you choose between three different modes, Comfort, Dynamic and Auto just like in the higher Audi models. But how much of a difference does that button make? To find out we put the Q3 through some hard to believe obstacles that it cleared with ease and then straight on to a race track which highlighted the Q3's dual character. Beginning with the offroad track the Q3 had to manage a tough trail of tall climbs, tricky descents and some unbelievable articulation angles as you can see in the pictures. And the Q3 passed all these obstacles with flying colours with nary a wheelspin. While the difference is dynamic and comfort wasn't that apparent on the offroad trail, it definitely made its presence felt on the right corners of the Kari racetrack. Not only did we do three hot laps around the track but also did some slalom runs and hard braking maneuvers that highlighted the tenacious grip offered by the famed quattro system. On the track, the difference between the comfort and dynamic settings were immediately apparent. The body roll was much higher in the Comfort mode, but switching to Dynamic made it stiffer and increased response time as well. Driving the Q3 in manual mode was an absolute blast and putting down all of the 380 Nm exiting a corner was no problem at all. Plenty of grip and impressive dynamics made the Q3 almost as nimble and quick as some sporty sedans available out there. Off-road or on road, the Q3 proved to be home on both surfaces. Lets take a look at the other models in the Q3 line-up. There is the manual S Edition which is priced brilliantly at Rs. 25.49 lakh, then you have the 35TDI quattro Premium which is priced at Rs. 32.54 lakh and the 35TDI quattro Premium+ which retails at Rs. 36.80 lakh. The 35TDI quattro Dynamic stands at the top of the heap and is priced at Rs. 38.40 lakh (all prices ex-showroom Mumbai). While those on a budget looking for a Q3 will stick to the S Edition or at most upgrade to the Premium variant, but for those looking for their Q3 with all the bells and whistles, the new Dynamic offers a lot more value than the Premium+ variant. Not only do you get the new design updates, but also get a Q3 which can change its character at the press of a button. While one really needs to take the Q3 Dynamic in testing environments to to see how much of a difference that little button makes, the important question is whether the Dynamic is worth the extra cash or not and the answer to that is a resounding yes!